SNES Mega Man X3 (USA) in 38:14.65 by FractalFusion. In Mega Man X3, you will find yourself finally using Zero's coveted sword. The author speeds through the game very rapidly, and uses the sword to beat the 8 bosses very quickly the second time around. This run is a whopping 1:36 faster than the last version, both by using some new tricks and playing with more precision. 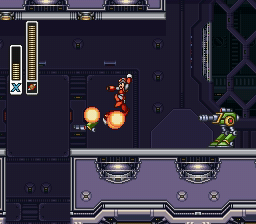 The page Mega Man X Tricks explains some of the tricks that can be used in the X series games.